Forex traders have very suddenly tilted their collective focus towards interest rate differentials. Given that the Dollar is once again in a state of free fall, it seems the consensus is that the Fed will be the last among the majors to hike rates. As I’ll explain below, however, there are a number of reasons why this might not be the case. First of all, the economic recovery is gathering momentum. According to a Bloomberg News poll, “The US economy is forecast to expand at a 3.4 percent rate this quarter and 3.3 percent rate in the second quarter.” More importantly, the unemployment rate has finally begun to tick down, and recently touched an 18-month low. While it’s not clear whether this represents a bona fide increase in employment or merely job-hunting fatigue among the unemployed, it nonetheless will directly feed into the Fed’s decision-making process. 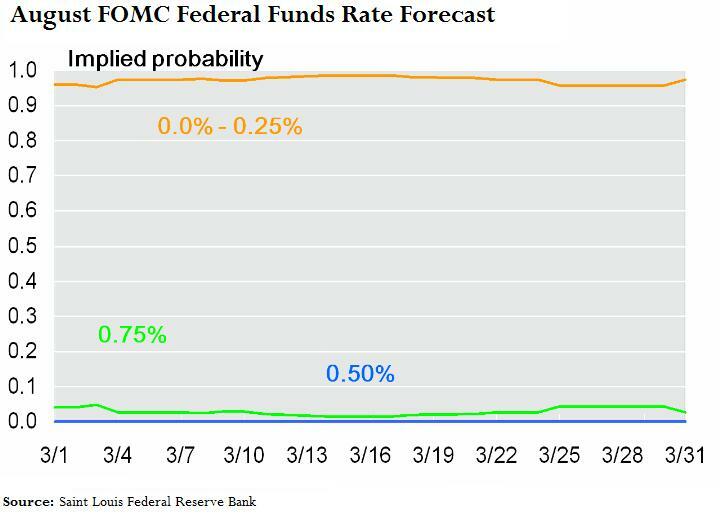 To be sure, interest rate futures reflect a 0% likelihood of any rate hikes in the next 6 months. In fact, there is a 33% chance that the Fed will hike before the end of the year, and only a 75% chance of a 25 basis point rise in January of 2012. On the other hand, some of the Fed Governors are starting to take more hawkish positions in the media about the prospect of rate hikes: “Minneapolis Federal Reserve President Narayana Kocherlakota said rates should rise by up to 75 basis points by year-end if core inflation and economic growth picked up as he expected.” Given that he is a voting member of the FOMC, this should not be written off as idle talk. Meanwhile, Saint Louis Fed President James Bullard has urged the Fed to end its QE2 program, and he isn’t alone. “Philadelphia Fed President Charles Plosner and Richmond Fed President Jeffrey Lacker have also urged a review of the purchases in light of a strengthening economy and concern over future inflation.” While the FOMC voted in March to “maintain its existing policy of reinvesting principal payments from its securities holdings and…purchase $600 billion of longer-term Treasury securities by the end of the second quarter of 2011,” it has yet to reiterate this position in light of these recent comments to the contrary, and investors have taken notice. Assumptions will probably be revised further following tomorrow’s release of the minutes from the March meeting, though investors will probably have to wait until April 27 for any substantive developments. The FOMC statement from that meeting will be scrutinized closely for any subtle tweaks in wording. Ultimately, the take-away from all of this is that this record period of easy money will soon come to an end. Whether this year or the next, the Fed is finally going to put some monetary muscle behind the Dollar. « Retail Forex: Lower Corporate Profits = Lower Spreads for Traders?